A steep roofline and front facing gable combine with a brick façade giving this 1 ½-car garage plan plenty of street appeal and a look that is sure to blend with many different home styles. A 10’x8’ overhead garage door opens to 424 square feet of usable parking and storage space neatly accommodating one automobile with plenty of room left over for storage shelves, the lawn mower or even a workbench and cabinets. You’ll appreciate the handy service door for easy entry and the utility sink making light work of a variety of outdoor clean-ups. 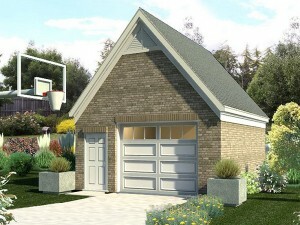 Add storage or parking and functionality to your home with this charming detached garage plan. For further information about this design, please visit our web page. 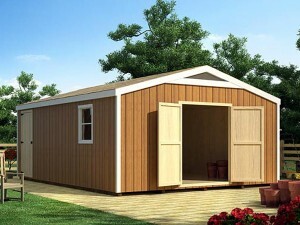 Please visit The Garage Plan Shop to browse our other collections of detached garage plans.